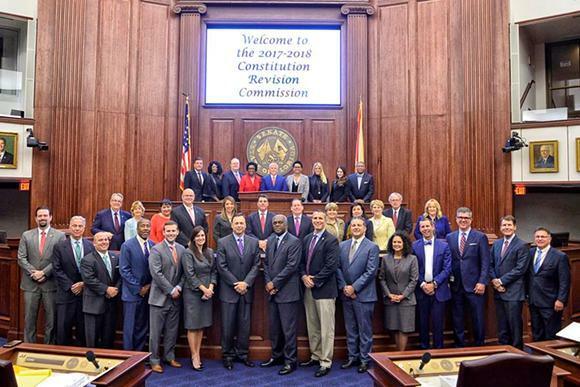 The 2018 Florida Constitution Revision Commission. Group photo. State lawmakers appear heading toward abolishing the state’s Constitution Revision Commission. This after the latest incarnation of the group was roundly criticized for being overtly political. The effort has generated a rare point of bipartisanship between lawmakers and advocacy groups who don’t normally agree on anything. “I think we’ve gone from a committee of our peers, citizens who get together every 20 years and look to see where there are places where revisions could be made, to a super political committee," says Rep. Brad Drake, R-Eucheeana. He calls the group, the "Crony Committee," and says members of the last commission did voters a disservice. The CRC ended up putting seven amendments before voters in November. Some were grouped together in what the commission said was an attempt to avoid ballot fatigue. Critics saw those combinations as an attempt to trick voters into passing unpopular ideas. The LeRoy Collins Center, a policy think tank, says it would rather the Commission be amended, not abolished. During an interview last year, Center Director Carol Weissert called the bundled amendments “a little bit of a reach” and questioned whether most of them even belonged in the state’s governing document. Take one amendment that granted expanded survivor benefits to first responders, coupled with tuition issues at the state’s universities, and putting the Florida College System into the constitution. “I was frustrated and disappointed, candidly, with the outcome of the most recent Constitution Revision Commission," says Rep. Ben Diamond, D-St. Petersberg. He agrees the last CRC went too far with its bundled amendments, and also questions the group's decision-making. But Diamond is hesitant about throwing it out. "Even though I wasn’t enamored by some of the work of this most recent CRC, it provides a forum to think about big questions about the structure of state government—how are we going to reorganize our state cabinet? And I think back to prior commissions, like the one chaired by Sandy D’Alemberte, and Dexter Douglass, and I felt like they were trying to address those bigger issues. That’s the appropriate role of the commission in my perspective," he said during a Thursday hearing of Drake's bill before the House's Judicial Committee. The 1997-98 Commission is often held up as an example of good governance. The first formal Constitution Revision Commission met in 1977, and twenty years later in 1997. The most recent version started its meetings in 2017. But after 60 years and three different incarnations, Rep. Steve Geller, D-Aventura, wants it gone. “Still up on this bill. We have 19 years to come up something else," he says. The Senate feels similarly, and a companion bill to abolish the CRC could soon be up for a full chamber vote. The voices favoring abolishing the Constitution Revision Commission appear louder than those trying to save it. The CRC initially approved seven amendments to appear before voters on the November 2018 ballot, but one was removed by the Florida Supreme Court for being misleading. In all, voters approved 11 new additions to the state constitution, rejecting only one-- an increase in the state's homestead tax exemption. Florida lawmakers are also considering other plans to make it harder to amend the state's constitution. One proposal limits amendments to a single-subject, eliminating the "bundling" of different ideas together. Another, by Sen. Dennis Baxley, R-Ocala, raises the threshold of approval for amendments from 60 percent to two-thirds. Lawmakers are considering a plan to get rid of Florida’s Constitution Revision. After some say the board is out of control. Blaise Gainey reports. A bill to limit constitutional amendments to one subject passed its first committee unanimously Tuesday. The bill sponsor says bundling issues into one ballot initiative is unfair.